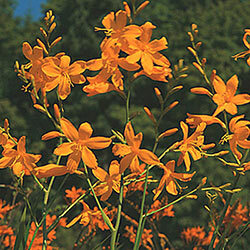 Gold Rush Crocosmia | Summer Blooms | Michigan Bulb Co.
You've Struck Gold with This One! It doesn't seem like it should be this easy to grow such tropical beauty, but the golden and bronzy hues of Gold Rush Crocosmia wake up the summer garden with very little effort on your part. The blooms line romantically arching stems, that are just as elegant in a vase as they are in the yard. 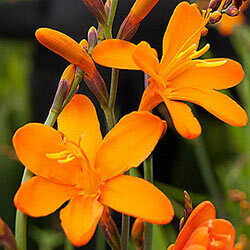 In fact, Gold Rush blooms stay bright for up to two weeks in a cut flower arrangement. The foliage will make a nice display even after the flowers fade, especially when joined by late season seed pods. You'll have plenty of hummingbirds stopping by with this. 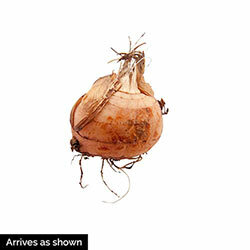 Planting Instructions: Plant 6" deep and 3-6" apart. Soil Requirements: Prefers moist well drained soil.